I really love leftovers. But mainly because I repurpose them to be completely new meals. If you’re cooking for two, like me. Then you probably end up with leftovers all the time. I’ve heard tell that some husbands exist that won’t eat leftovers. In my opinion, those husbands deserve to go hungry. But thankfully, mine will eat leftovers and eat them gladly. This doesn’t keep me from being a bit creative with my leftovers from time to time. 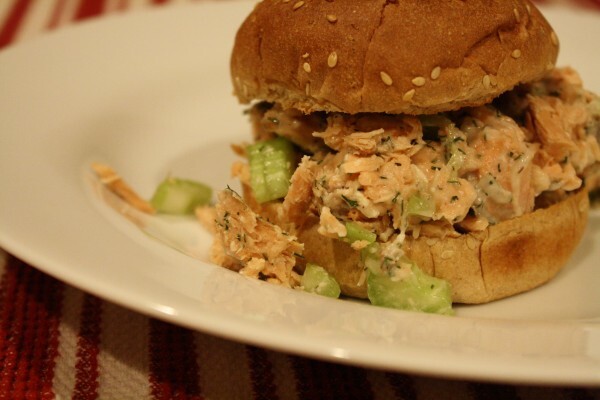 When I made salmon the other night, I already had in mind what I wanted to do with the leftover salmon. The salmon I bought was enough for two. I cooked half of it for that night’s intended meal and I threw the other half in a baking dish with a bit of salt and pepper. 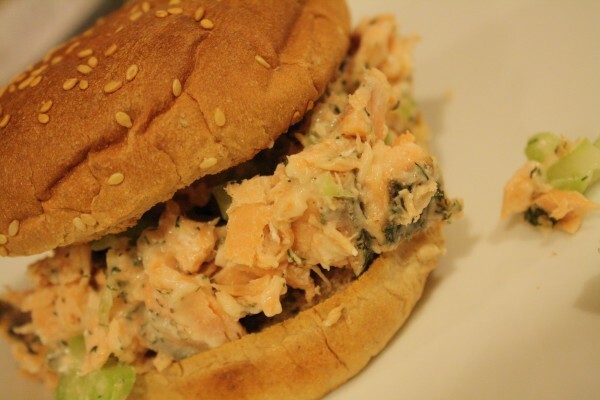 Perfect for turning into salmon salad later on in the week. 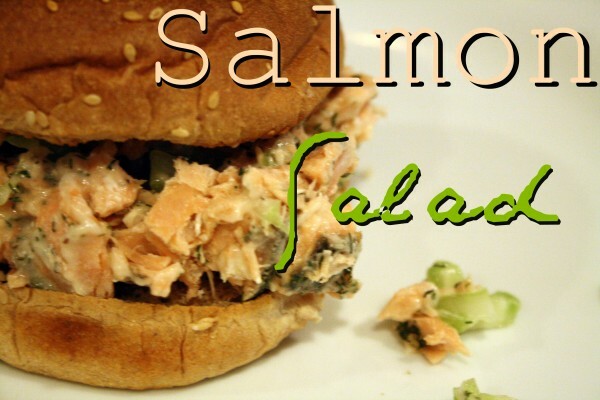 The first paragraph can be done days ahead of time, for an easy meal of leftover salmon any night of the week. Preheat oven to 400 degrees F. Sprinkle salt and pepper over the salmon. Grease a small baking dish with oil. Place fish in the baking dish and put in hot oven. Cook for 15 minutes. Remove salmon from oven and allow to cool. 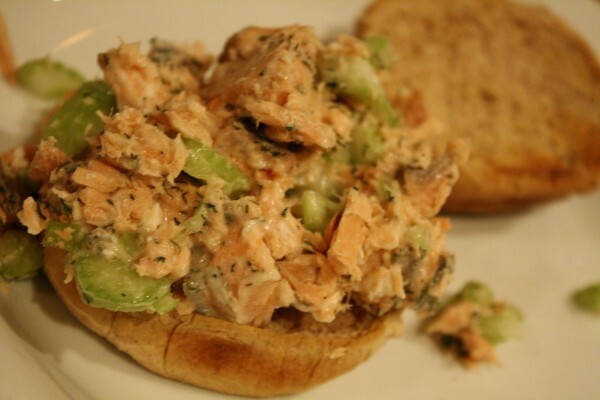 Chop salmon coarsely and place in a medium sized bowl. Add dill, celery, and mayo. Stir ingredients well to combine. Taste and add extra salt if desired. Spoon onto whole wheat buns if desired. This is such an easy and healthy meal. 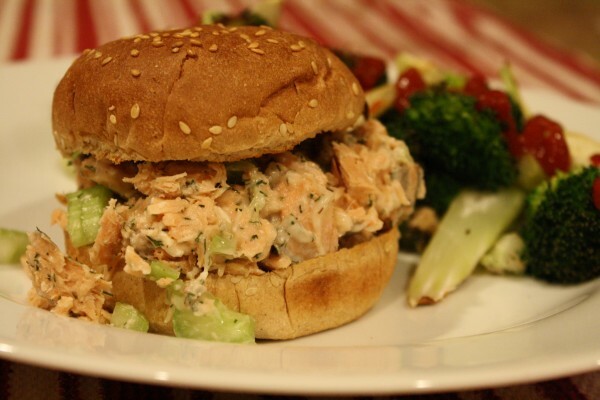 Of course, it’s especially easy if you are using the salmon up as leftovers. You could also sauté the salmon and it would turn out just as great. I served some roasted broccoli and fennel bulb (with ketchup, of course) on the side. The whole meal came together quickly and effortlessly. And I had time for more important things like doing laundry catching up on blog reading. Catching up? Who am I kidding? My Google reader has said 1000+ since my honeymoon a year and a half ago. Sometimes leftovers taste even better than the original dish when it was fresh out of the pan/oven (just about anything in a casserole dish especially)! Since I moved away from home my mom has developed this weird aversion to leftovers so now all gatherings or dinners include my bringing a sack of tupperware to take home all of the awesome and free leftover goods! Woot! I totally agree. That reminds me that I need to visit my grandparents more. They’re not adverse to leftovers, but they love to send me home with food. Me too! Leftovers are better than having a refrigerator full of ingredients on week nights.